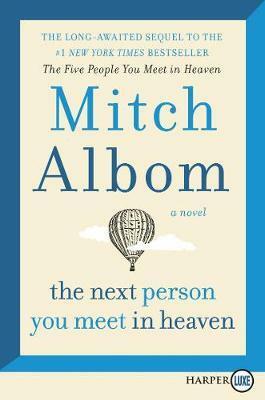 In Mitch Albom's beloved number one bestseller, The Five People You Meet in Heaven, Eddie, a war veteran turned amusement park mechanic, dies saving a young girl named Annie from a tragic accident. Although he felt his life was meaningless on earth, Eddie learns from five people in heaven how much his--and every life--matters. In this long-awaited sequel, Annie is whisked into her own heavenly journey after her wedding day--and into an inevitable reunion with Eddie, one of five people who will show her how her earthly life touched others in ways she could not have fathomed. The Next Person You Meet in Heaven reminds us once again that all endings are beginnings--even if we don't know it at the time. Mitch Albom has written six consecutive number one New York Times bestsellers. Albom's books have collectively sold more than thirty-six million copies in forty-two languages. He founded and oversees S.A.Y. Detroit, a consortium of nine different charitable operations in his hometown. He also operates an orphanage in Port-au-Prince, Haiti. He lives with his wife, Janine, in Michigan.